This is the twelveth movie in the Boston Blackie series. Boston Blackie, ex-convict and amateur magician, is doing his act at a prison-for-women, Inmate Dinah Moran escapes, determined to wreak vengeance on the man who done her wrong. 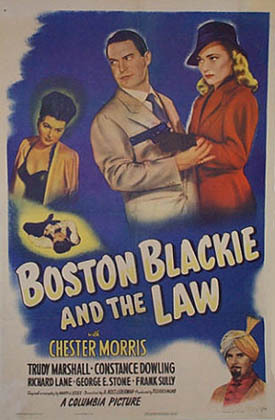 Held as an accomplice, Blackie gets away and starts the search to find the escapee, and her ex-husband who was involved in the crime for which she was sentenced to prison. This is essentially a remake of 1942's Alias Boston Blackie. In the original, a falsely accused convict escapes while Blackie is putting on a magic show for a men's prison, prompting Blackie to stop the escapee before he can kill the man who framed him. In both the original and the remake, Chester Morris is given ample opportunity to show off his considerable skills as a magician. While performing during the annual Thanksgiving party at a women's penitentiary, Boston Blackie, an amateur magician and reformed thief, asks for a volunteer to step into his magic box. When inmate Dinah Moran raises her hand, Blackie ushers her into the box and she vanishes not only from the box, but from the prison as well. 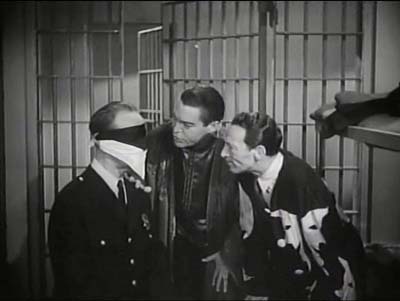 Unable to make Dinah reappear, Blackie is arrested as an accomplice in her escape. Inspector Farraday, Blackie's nemesis, takes him into custody and questions him about a cryptic note found under Dinah's bed stating "Lampau to be married next Sunday." After tricking Farraday's assistant, Sgt. Matthews, into letting him step into the magic box, Blackie escapes from police headquarters and meets his associate, The Runt, at the library. There, Blackie learns from reading some newspaper files that Dinah was formerly married to a magician named Lampau. The couple had been involved in a $100,000 robbery, and although the money was never recovered, Lampau was acquitted of the crime while Dinah was given a three-year prison sentence. Through a magician friend, Blackie discovers that Lampau changed his name to John Jani and is currently performing at a local theater. Upon visiting Jani in his dressing room, Blackie learns that the magician plans to marry his assistant, Irene, on Sunday. Just as Blackie is warning Jani that his ex-wife has escaped from prison, Dinah bursts into the room, gun in hand, and after ordering Blackie into a closet, demands the money from Jani. When Jani lunges for Dinah's gun, the weapon fires and Dinah runs out the back window. To protect the magician and trap Dinah, Blackie arranges to impersonate Jani. After escorting Jani to a vacationing friend's apartment, Blackie dons the magician's robes and takes up residence in his apartment. The next morning, Blackie, still impersonating Jani, goes to the magician's bank, opens up his safety deposit box and discovers the $100,000. After Blackie leaves the bank, Dinah approaches him, and at gunpoint, orders him into his car and demands the money. When Blackie hands her an empty folder, Dinah, thinking that it contains the money, orders him out of the car and drives off. Proceeding to the theater, Blackie informs Irene about Jani's criminal past and confides that he plans to use the money to trap Dinah. Soon after, Blackie's vacationing friend returns and finds Jani's dead body in his apartment. Once again arrested for murder, Blackie tricks his guard and escapes from his cell. He proceeds to the theater, arriving just after Irene shoots Dinah. Irene then smugly admits that she also killed Jani and sent the note to Dinah in prison, hoping that she would lead her to the money. 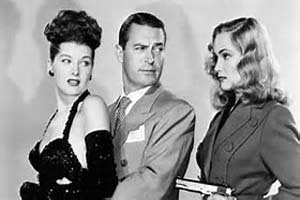 Boasting that Blackie will pay for her crimes, Irene phones Farraday and tells him that Blackie killed Dinah. When Farraday arrives, Blackie claims to have recorded Irene's confession on the phonograph in the dressing room. Blackie then turns on the phonograph, and through ventriloquism, mimics their previous conversation, tricking Irene into revealing that she is the murderer.